I dined at Millwater Bistro & Bar in early February after the incredible wine list lured me there and jumping out and seducing me was vintage 2008 Blanc de Blancs bubbles from Johanneshof Cellars in Marlborough. How could I resist as Johanneshof has a special place in my vinous memory not only for the fabulous day with Warwick and Rachel one Easter when we passed through Marlborough on holiday but also for their stunning gewurztraminer. Johanneshof Blanc de Blancs 2008 was an excellence choice not only for sentimental reasons but also for the deliciously creamy and savoury taste. Delightful to sip on and also a terrific match to our shared starter plates especially the sun-dried tomato in the mixed olives with feta, and the tiny button mushrooms tossed with parmesan and lime. It’s a methode traditionelle made from a chardonnay base and prior to release it had six years ageing on yeast lees in Johanneshof’s unique underground cave that goes into the hill beside their cellar door at Koromiko between Picton and Blenheim in the Marlborough wine region at the top of the South Island. Definitely worth a visit if you are down that way. Check it out at www.johanneshof.co.nz. Millwater B&B price was $58. My restaurant review is on TripAdvisor here: I gave it 4 stars because although the wine and food was fabulous, we were let down a little by the service. It happens. 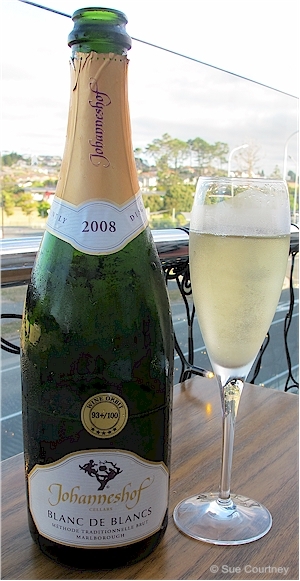 This entry was posted in #nzwine, bubbles, cellar-aged, marlborough, NZ regions and tagged 2008, Blanc de Blancs, Johanneshof, Methode, Millwater by Sue Courtney. Bookmark the permalink.